Checking an aircraft for damage can be arduous and meticulous work, but last week’s issue of The Economist highlights an experimental commercial approach. In simple terms, the Remote Intelligent Survey Equipment for Radiation (RISER) drone is a quadcopter with LIDAR and forms the basis for a system to use lasers to automatically detect damage to airliners. The obvious naval application for inspector drones would be for ground-, carrier, and surface vessel-based fixed-wing and helicopter units, although the configurations for each aircraft type and location might make some more practical than others. For example it probably makes more sense to consolidate expertise in inspector drones at regional maintenance and readiness centers than to try to outfit a unit in the small helicopter hangar of every destroyer. But there’s always something to be said for an operational capability. 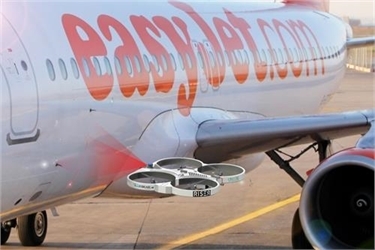 While The Economist notes that the drones are allowed at Luton airport, UK, to “operate only inside hangars, and only when the doors are shut,” similar systems could be used during periods of extended surface ship and submarine maintenance, particularly while in dry dock to check for damage and wear and tear to those vessels’ hulls and systems. We’ve speculated previously at CIMSEC on the utility of LIDAR-equipped shipboard robots and autonomous systems to engage in damage control, but external hull and airframe inspection drones add a wrinkle and join an ever-growing list of potential (and actualized) uses for drones.